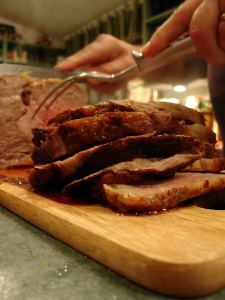 Roast beef is a classic cut of meat and perfect for that Sunday dinner with the in-laws or whatever other occasion you’re having. Cooking it right takes practice, but it’s a whole lot easier with a great recipe. Happy cooking! Pre heat your oven at 400 degrees. In a medium mixing bowl, add tomato sauce, water, spices, and flour. Blend gently. Place roast in the oven bag along with the mixture from the bowl. Add your vegetables and shake the bag slowly to coat all your contents. Tie the cooking bag securely with string or another oven safe option. Place the bag in an oven safe dish with several slits on top. Bake at 400 degrees for 2 hours or until the meat looks tender. This dish is beautifully complimented with a fresh garden salad and nice dry Merlot. Roast beef is rich in B vitamins, protein and iron, which have numerous health advantages.